We haven’t managed to “get out there” anywhere near as much as we did during the early summer of last year. This is not only due to the fact that the weather has been a little hit and miss, but we also had family come to visit over the festive period so chose to stay close to home to spend time with them. 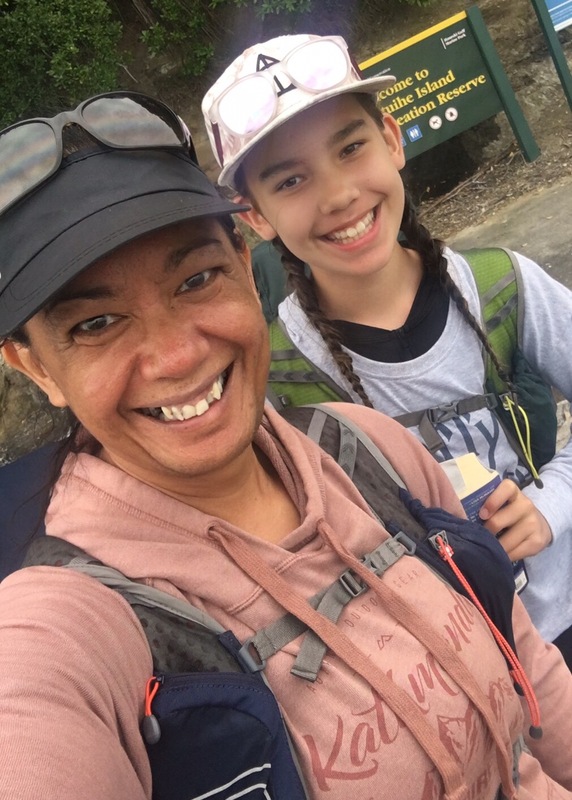 Now that things have returned to normal, Isabelle and I decided it was time to head off on a girl’s adventure – choosing to visit somewhere that we’d never been before, Motuihe Island. Motuihe is a small (440 acre) Island situated between Motutapu and Waiheke Islands in the Hauraki Gulf of Auckland which although is controlled by the Department of Conservation, is administered by the Motuihe Trust. Isabelle was very thankful for this, because not only does the trust run guided walks and generally look after the place, they also run a little store from the information centre that sells ice cream! Being a tiny island in the Hauraki Gulf you usually need to have your own boat or hire a water taxi to get to the Island, however during the summer period, Red Boats runs a daily ferry service from Westhaven, so James dropped his two intrepid travelers off in time for the Saturday morning sailing. You can (as other campers did) take a TONNE of camping gear on the ferry, but Issy and I went minimalist and only took what we could carry on our backs, which was actually quite a lot. I carried the tent, sleeping mats, sleeping bags, cooking gear (jetboil), the first aid kit, sunscreen, insect repellent and the personal locator beacon (which just seems to come everywhere with me – just in case). Issy then carried our clothes and food and we both carried pillows, water, head lamps, sanitizer, our phones, battery packs and toiletries. Which I guess isn’t THAT minimalist, but the other campers on the ferry seemed stunned/impressed that we had everything we needed in “those two little bags”. Before arriving we had looked at the campground map to book a campsite. Without knowing anything about the topography of the island we chose a site in the Confidence Course as it looked tucked away from the main campground and it was relatively close to the toilet block. Upon arrival our designated area turned out to be a tiny clearing on the side of the path that went to the “main” campground, which I would have completely missed if there had not already been a small group who had set up their tents. Isabelle decided that it was by far the best area because it was uber close to the ice cream shop and over the course of our stay I determined it was a very convenient place to be, however the down side was that there was no shade and the views were nothing compared to the ones you got from the other sections of the campground. Next time I *might* trade convenience for the stunning views across to the city you’d get from your tent if you set yourself up in Captain’s Camping – but then again, we were in the ocean the majority of the time, so the views would have been wasted on us anyway and having a large, super clean and nice changing room so close made peeling off your wet swimming gear a breeze. You can do as little or as much on the island as you want – you can hike (we did not) go tuatara spotting (we also did not, but a number of people we spoke to had made the effort and had seen them) or, support the trust and take a guided walk (we – um – did not), instead, we lay in the sun, got hot, swam in the ocean, got cold and then repeated the process again and again and again .. Previous story What’s Your Why?